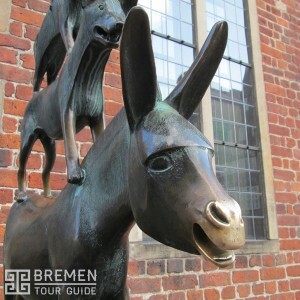 Welcome to the City Municipality of Bremen, a Hanseatic city in northwestern Germany. A commercial and industrial city with a major port on the River Weser. 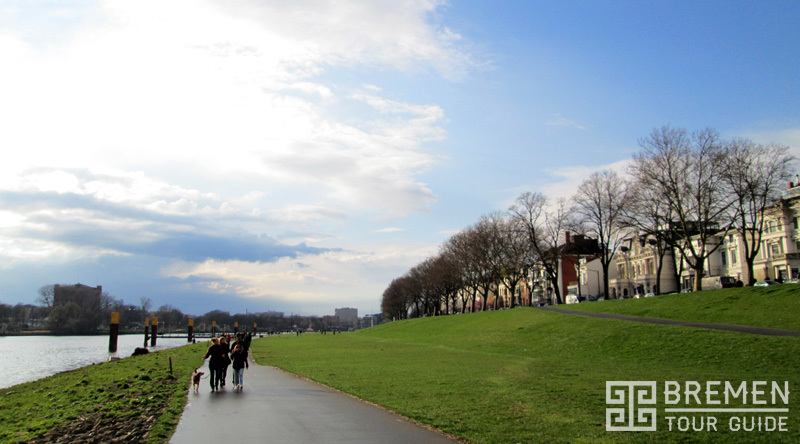 Bremen is the second most populous city in Northern Germany and tenth in Germany. Bremen is some 60 km (37 mi) south from the Weser mouth on the North Sea. With Bremerhaven right on the mouth the two comprise the state of the Free Hanseatic City of Bremen. 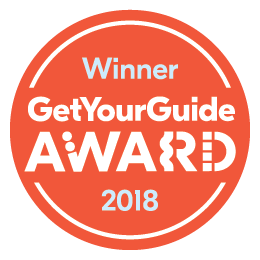 You can directly book a guided tour here. Burial places and settlements in Bremen date back to the 7th century AD. 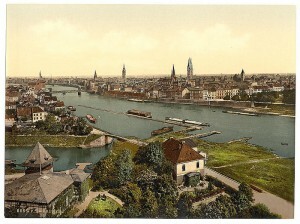 In 150 AD the geographer Ptolemy refers to Fabiranum or Phabiranum, known today as Bremen. At that time the Chauci lived in the area now called north-western Germany or Lower Saxony. By the end of the 3rd century, they had merged with the Saxons. In 787 Willehad of Bremen was the first Bishop of Bremen. In 848 the archdiocese of Hamburg merged with the diocese of Bremen into Hamburg-Bremen Archdiocese, seated in Bremen, and in the following centuries the archbishops of Hamburg-Bremen were the driving force behind the Christianisation of Northern Germany. 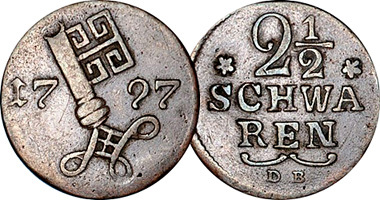 In 888 Archbishop Rimbert, managed to get Kaiser Arnulf of Carinthia, the Carolingian King of East Francia, to grant Bremen the right to hold its own markets, to mint its own coins and make its own customs laws. The city maintained imperial status with the ability to mint its own coinage until 1867. 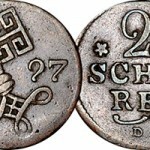 The Bremen key design appears on most of its coins, although few are as pronounced as the 1 and 2 1/2 schwaren coins. The Dom Cathedral is included in our English Marketplace and Dom Tour. The city’s first stone walls were built in 1032. Around this time trade with Norway, England and the northern Netherlands began to grow, thus increasing the importance of the city. Since the city was the major taxpayer, its consent was generally sought. In this way the city wielded fiscal and political power within the Prince-Archbishopric, while not allowing the Prince-Archbishopric to rule in the city against its consent. 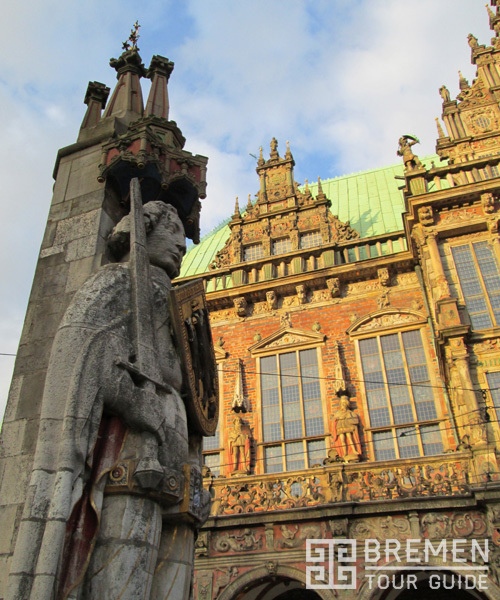 In 1260 Bremen joined the Hanseatic League. In 1362, representatives of Bremen rendered homage to Albert II, Prince-Archbishop of Bremen in Langwedel. 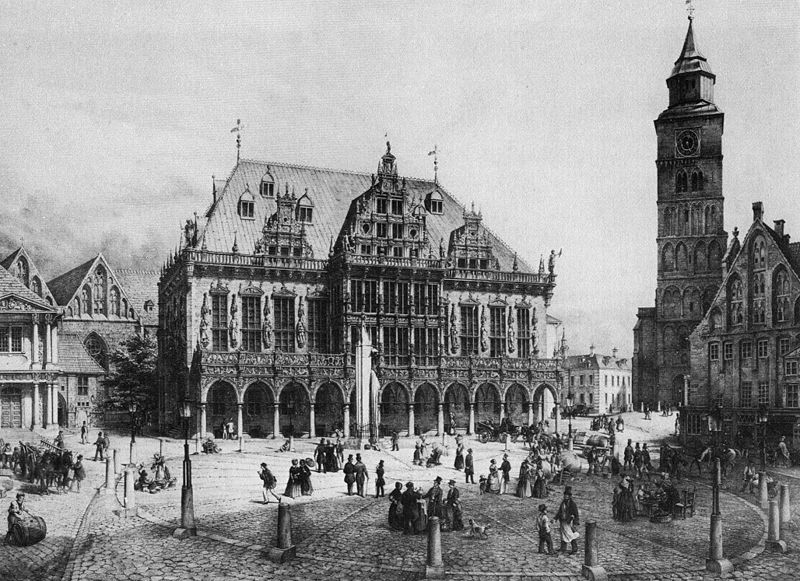 In return Albert confirmed the city’s privileges and brokered a peace between the city and Gerard III, Count of Hoya, who since 1358 had held some burghers of Bremen in captivity. The city had to bail them out. In 1365 an extra tax, levied to finance the ransom, caused an uprising among the burghers and artisans which was put down by the city council after much bloodshed. Nevertheless, on the night of 29 May 1366, Albert’s troops, helped by some burghers, invaded the city. After this the city had to render him homage again, the Bremen Roland, symbol of the city’s autonomy, was demolished and a new city council was appointed. In return the new council granted Albert a credit amounting to the enormous sum of 20,000 Bremian Marks. When the Protestant Reformation swept through Northern Germany, St Peter’s cathedral belonged to the cathedral immunity district (German: Domfreiheit), an extraterritorial enclave of the neighbouring Prince-Archbishopric of Bremen. In 1532, the cathedral chapter which was still Catholic at that time closed St Peter’s after a mob consisting of Bremen’s burghers had forcefully interrupted a Catholic mass and prompted a pastor to hold a Lutheran service. In 1547, the chapter, which had in the meantime become predominantly Lutheran, appointed the Dutch Albert Rizaeus, called Hardenberg, as the first Cathedral pastor of Protestant affiliation. Rizaeus turned out to be a partisan of the Zwinglian understanding of the Lord’s Supper, which was rejected by the then Lutheran majority of burghers, the city council, and chapter. So in 1561—after heated disputes—Rizaeus was dismissed and banned from the city and the cathedral again closed its doors. In 1827, Bremen, under Johann Smidt, its mayor at that time, purchased land from the Kingdom of Hanover, to establish the city of Bremerhaven (Port of Bremen) as an outpost of Bremen because of the increased silting up of the river Weser. Bremen became part of the North German Confederation in 1867 and became an autonomous component state of the new-founded German Empire in 1871 and stayed with Germany in its following forms of government. Brauerei Beck & Co KG, a brewery, was founded in 1837 and remains in operation today. The shipping company The North German Lloyd (NDL) was founded in 1857. In 1872, the Bremen Cotton Exchange was founded. Henrich Focke, Georg Wulf and Werner Naumann founded Focke-Wulf Flugzeugbau AG in Bremen in 1923. Borgward, an automobile manufacturer, was founded in 1929, and is today part of Daimler AG. Bremen has an oceanic climate and is influenced by its proximity to the coast and marine air masses that originate over the Atlantic Ocean. Nearby wetlands also enjoy a maritime temperate climate. Snowfall is rare, generally occurring several times in german winter.